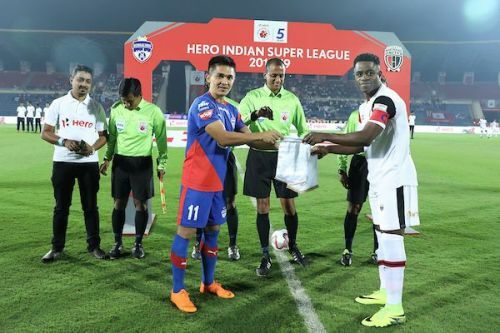 NorthEast United FC hosted the undefeated Bengaluru FC in their fifth home game in the Indian Super League 2018-19 edition. The game promised to be an exciting encounter given it was a clash between the table toppers. Bengaluru who sit at the top of the table wanted to keep their unbeaten run going in the tournament. Northeast United wanted to dethrone Bengaluru at the top of the table and end their unbeaten run in Guwahati. The game began with both the teams taking a cautious approach to the game and both the sides showed signs of not wanting to lose the game or concede an early goal. The scoreboard at halftime read Northeast United 0-0 Bengaluru FC. In the second half both the sides showed more vigour and showed urgency to win the game. Northeast United made use of the Possession they had and scored in the 64th minute through Federico Gallego. Bengaluru though were not the ones to go out of the tie without a fight, and they equalised through Chencho in the dying minutes of the game to keep Bengaluru FC unbeaten run intact. The game ended 1-1 a fair result given the way the game was played. While the nation wants to see, young Indian players develop and play a better brand of football. It also wants to see the overall level of football development. While the stadiums and practice grounds to the dressing rooms have seen an upliftment, the standard of refereeing has remained the same, or if one has to put it aptly, it has deteriorated. during this match too certain decisions that were taken by the referee had a dubious nature to it. The first incident that comes to mind is the disallowed goal of Ogbeche in the first half for offside. Ogbeche initially was in an offside position when the pass from Provat Lakhra was played, and that is why he didn't run after the ball. The linesman didn't raise his flag, and Bengaluru kept playing. Albert Serran played a backpass to Gurpreet which Ogbeche intercepted and slotted the ball past Gurpreet. As per the rule book, the goal should have been allowed as Bengaluru resumed play and Serran's position made Ogbeche in an onside position. But, the linesman, it seems flagged him offside for the previous segment of the game which ended the moment Serran played the back pass to the keeper. Given the ultimate result of the game, this decision proved to be costly for the Highlanders. A lot of fouls were also at times given and not given which hampered both BFC and NEUFC. 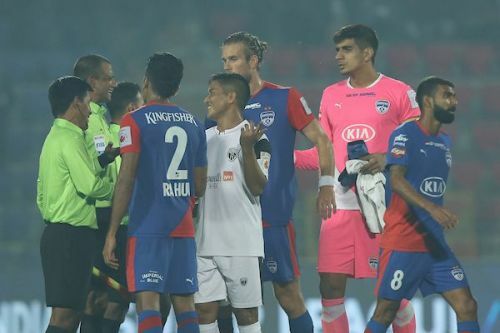 The play that lead to Bengaluru's equaliser also had an element of doubt as it looks like Reagan could have been fouled but the referee waved play on.